Michell Bearings has various products available for use in marine gearbox applications. 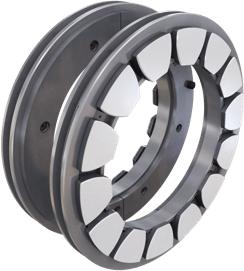 Where possible we will seek to utilise the Michell standard ranges of bearing internals (hyperlinks to Omega, Omega Equalised, SE and JPU sections) but bespoke solutions are available if required. 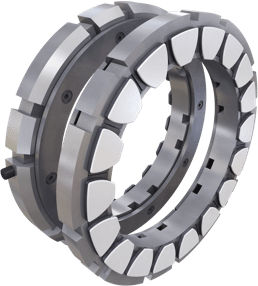 This can include special designs of radial bushes with plain or profile bores, special radial tilting pad bearings or specifically designed thrust bearing internals, with or without load equalisation features. Interacting equalising segments can be fitted behind the thrust pads to allow the thrust loads to be mechanically equalised across the entire thrust face. Plain bushes, profile bushes or centre / offset pivoted radial pads are available.